Derwent was named after the Derwent River in Hobart, Tasmania. HMAS Derwent was the first RAN vessel to launch a guided missile when she fired a Seacat missile on May 25, 1964. From 1991 to 1992, Derwent’s Seacat and Ikara launchers were removed. 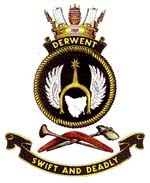 During this time, Derwent was used as a training vessel. Prior to Australian ships deploying to the Persian Gulf, Derwent conducted trials in launching the RBS 70 Surface to Air Missile from a naval platform. Derwent was decommissioned at HMAS Stirling on August 8, 1994 after 30 years’ service, HMAS Derwent had steamed 890,927 nautical miles (1,649,997 km) during her naval career. Following scientific tests to study ship survivability, Derwent was sunk in deep waters, 15 nautical miles (28 km) west of Rottnest Island as a "fish attraction device" on December 21, 1994.